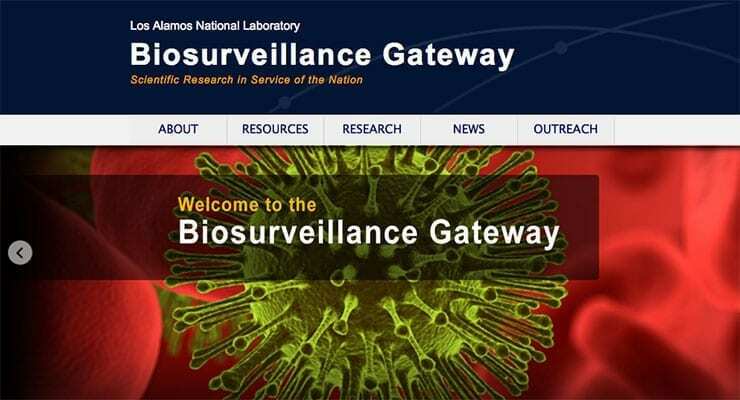 Los Alamos National Laboratory has officially opened their new virtual Biosurveillance Gateway, providing a centralized portal for all news, information, resources, and research related to biosurveillance at the laboratory. “The goal of the site is to support global disease surveillance, providing useful tools developed at Los Alamos for professionals around the world to reference from a single location,” said Alina Deshpande, the project’s leader. Biosurveillance, an emerging field of importance for national security, is the process of gathering, integrating, interpreting, and communicating essential information that might be related to disease activity and threats to human, animal, or plant health. The site offers a variety of Los Alamos-developed biosurveillance tools that can be used for decision support in disease surveillance. Examples of tools include sequence databases for HIV and viral hemorrhagic fevers such as Ebola, apps for contextualizing disease outbreaks based upon historical data, as well as advanced bioinformatics software packages. Continuing updates and expansions will occur over time, offering more tools and information for the technical audience, Deshpande said. Resources: Access to Los Alamos-developed resources including Biosurveillance Analytics Resource Directory (BARD), Sequedex, Pathogen Databases and Open Source Software for biosurveillance applications. News: The latest biosurveillance research and initiatives at LANL. The team plans to expand the site’s offerings in the near future, broadening the reach to include additional Los Alamos-developed tools and potentially those from national and international sources, as well as collecting relevant research papers that can help provide a deeper contextual reference. “With this website and associated tools, we offer a capability to enhance situational awareness and surveillance for infectious diseases worldwide, a major need that has been called out recently by experts in this field,” said Deshpande.